We are incredibly proud of our work helping children with hearing loss learn to listen and speak. The vast majority of children graduating from our world-leading program achieve spoken language at the same level as normal hearing children by the time they are ready for school. 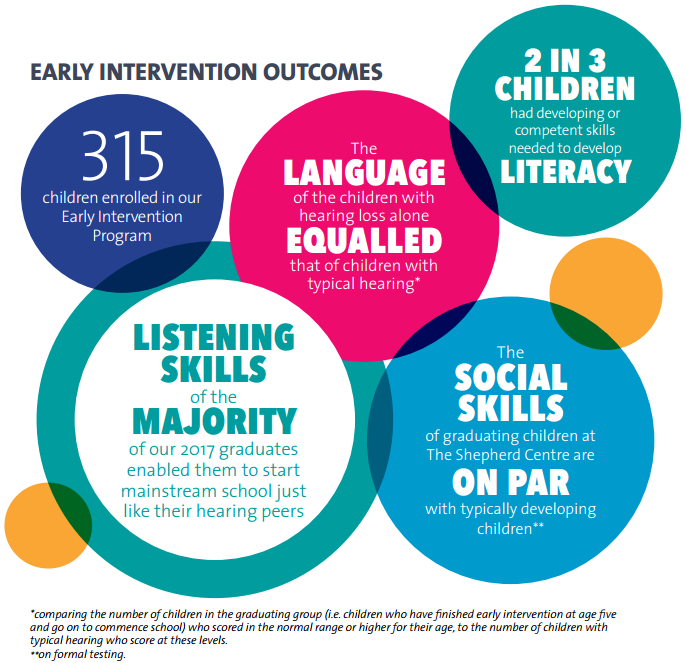 These outcomes have earned The Shepherd Centre an international reputation as a centre of excellence in helping children with hearing loss learn to listen and speak. Download our Shepherd Centre Impact Report 2017. The majority of our graduates enter mainstream schools with communication skills on par with their hearing peers. These wonderful results developed from our commitment to three key principles – family focus, quality and industry leadership. These core principles have underpinned our approach to childhood hearing loss that is unparalleled; no other centre we know of across the globe has published results matching ours. We are a world leader in the field of Auditory Verbal Therapy (AVT); we have given hundreds of parents the tools and strategies they need to build their child’s language and listening skills and create a future full of sound and speech. Our high standards in delivering quality programs that are tailored to the individual needs of each family, backed up by global research and analysis, has placed us in the unique position to change the lives of all Australian children with hearing loss. To read our success stories, please click here. To read our parent testimonials, please click here. To see our results in more detail, download a copy of our Shepherd Centre Impact Report 2017. To view our 2016 Impact Report click here.